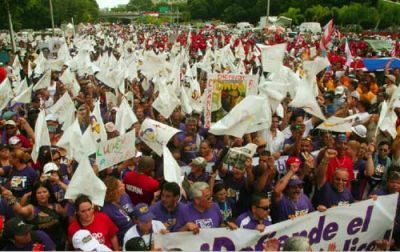 A STRIKING ISLAND: More than 200,000 Puerto Ricans joined a general strike Oct. 15. Fortuño, leader of the Partido Nuevo Progresista (the equivalent of the Republican Party), was inaugurated Jan. 2, 2009. In his first 10 months in office he has fired more than 23,000 public-sector workers despite promising during his campaign that he would not make layoffs. His announcement on Sept. 25 that he was firing nearly 17,000 workers spurred labor, student, religious and community groups to organize a general strike on Oct. 15. The week before the general strike, 10 campuses of the University of Puerto Rico closed their doors to prevent student protesters from using the facilities to mobilize. During democratic assemblies that gathered record numbers, students had already closed the main university campus in solidarity with fired government workers, including teachers, janitors and other service employees. Despite the official intimidation, the demonstration and walkout went ahead Oct. 15, drawing an estimated 200,000 people and shutting down most businesses, schools and government activities on the island. During the protest, numerous workers said the massive layoffs were part an effort to “sell the island,” — to destroying public services in order to justify privatization and provide subsidies to companies owned by associates of the governor. Many people showed their dissatisfaction by scrawling anti-privatization messages on buildings. Others wore masks of the governor’s face while they brandished fistfuls of money. After the march, students blocked the country’s largest highway and kept it closed until the police and some conservative leaders pressured them to abandon their efforts. With a population of 3.5 million, Puerto Rico has been a U.S. colony since 1898. About 48 percent of the population lives under the poverty level and government layoffs, which represent about 12 percent of the public sector workforce, are projected to push the unemployment rate to 17 percent. The firings were made possible by Law 7, which passed in March. It allows Fortuño to unilaterally dismiss public-sector workers, overriding labor laws that previously prohibited such actions. Union contracts are no protection either, as Law 7 effectively voids any job protections they may contain. What’s more, Law 7 clears the way for firing more public-sector workers by allowing for “Public-Private Alliances” — a euphemism for handing over government functions to private corporations. While the governor and pundits claim the mass layoffs are necessary because the government is “too big” and is facing a $3.2 billion budget deficit, Puerto Rico is slated to receive more than $5.7 billion in funds from the U.S. stimulus package passed earlier this year. Fortuño also claims that private companies provide better services and that public-sector workers earn too much. Previous governors used the same justification for prior rounds of privatization that ended in disaster. Pedro Roselló, governor from 1992 to 2000, privatized health services and sold hospitals. While insurance companies fattened their profits by delaying payments and services, enabling them to earn interest on public funds, the population has seen co-pays increase and intolerable delays in basic and urgent care, as in the case of cancer patients. Moreover, government officials under Roselló reportedly stole money from an organization that provided services for AIDS patients. In 1998, Roselló also sold Telefónica de Puerto Rico, a public telephone company, an action that triggered an enormous two-day general strike. The following governor, Sila Calderón, the first female governor in the island (2000 to 2004), outsourced billing services in the Public Water Authority to ONDEO, a French company, which failed to meet the terms of its contracts but was paid $540 million. Aníbal Acevedo Vilá, the governor from 2004 to 2008, privatized testing services in the Department of Education and signed numerous contracts for millions of dollars with charter school organizations while denying salary increases to public school teachers. The independent teachers union, Federación de Maestros, staged a successful strike and won salary increases. Puerto Rican workers have also seen massive layoffs in the private sector as the economy has been in recession for more than four years now. The governor claims privatizing public services will create 200,000 new jobs by 2013. The government’s development plans include promoting medical tourism; privatizing much of the public energy authority; displacing poor communities to build expensive apartments and shopping malls; and a luxury resort, casino and marina on a former U.S. naval base. Few believe Fortuño’s promises, however, given the mass layoffs he claimed would never happen. Laid-off workers have few options. Even if they manage to land a job, an abysmal rate of private-sector unionism, less than 3 percent, means few protections. Private companies will not recognize decades of service in the public sector, offer health insurance or match government salaries. Meanwhile, despite promises of state support, fired workers wait in unemployment lines so long that people arrive the day before their appointment at the Labor Department to claim benefits; their only alternative is accepting a government offer of $2,000 to leave the island. Conservative and moderate groups are interested in getting concessions from the government even if this means reducing working hours for all public-service workers or eliminating the government’s contribution to the workers’ health insurance. During the 1998 strike against the sale of the public telephone company, leaders in some of these unions and organizations demobilized a mass-based movement that put up to 500,000 people in the streets. They negotiated a truce with the government, and the telephone company was finally sold. While the Oct. 15 mobilization marked a big step forward, halting and reversing privatization will require a still higher level of struggle. Independent unions, such as the university non-teaching employees union, called for a workers’ party during the march. The Federación de Maestros, the teachers’ union that held a strike under the former administration; the union of electric company workers; and political organizations such as la Organización Socialista Internacional and the Movimiento Socialista de Trabajadores called for organizing from below. These unions and political groups, together with other community organizations and university professors (Asociación Puertorriqueña de Profesores Universitarios), have supported calling a general strike in the future. Yolanda Rivera is a member of the Organización Socialista Internacional. Lee Sustar contributed to this report.